How do Du feel about the film?! Die Fanauswahl: Awesome!! i just CANT WAIT to see it!!!!! Did Robert Pattinson pass oder fail as Edward Cullen? do Du think that they should stop at twilight and not make any Mehr of the Bücher into movies? Pick your favourite crossover couple? Who is better Jacob Black oder Edward Cullen? Do Du think that there should be a new series of twilight? I was the new shiny toy Du could hear there hearts beating fast if Du listened. In the cafeteria I saw the best sight Edward Cullen the Liebe of my life. gorgeous messy hair skin as pale as a ghost I want him forever and will never let him go. Oh, Jacob Black. How we’ve missed you! Summit just released this sizzling new Foto of Taylor Lautner as Jacob running through the rain. Taylor’s been so busy promoting his movie Abudction that there hasn’t been much about Jacob in the news. But as the movie premiere datum approaches, we’ll be posting Mehr Updates like this from The Twilight Saga: Breaking Dawn Part 1. The three Twilight stars grace the covers of Entertainment Weekly in their latest issues. Check out the covers right here! Team Edward versus Team Jacob - Twilight Fans will surely become one of the two largest Clan , whether it vampire clan oder werewolft clan . When the official Press New Moon on the Frage of who would win if a war between Team Edward and Team Jacob. Robert Pattinson and Taylor Lautner have a different opinion about this. wether it will be add to scene in film? Rebecca Murray Hollywood Filme at the Los Angeles Premiere of Warner Bros.. Pictures Clash 'from the Titans. What Brings Du to Clash of the Titans? Alex Meraz: "I want to see the Clash of the Titans in 3-D, Sam Worthington - cool actors." MY opinion on Taylor lautner in New Moon but what made it exciting in NEW MOON is when JACOB TOOK OFF HIS hemd, shirt HE WAS SO SMOKING HOOOOOOOOOOOOOOOOOOOOOTTTTTTTTTTTTTTTTTTTTTTT!!!!!!!!!!!!!!!!!!!!!!!!!!!!! I WAS SCREAMING IN THE MOVIE THEATER! SOMETIMES WELL PRETTY MUCH EVERYDAY MY BFF'S THEY SAY IM CRAZY CAUSE I ALWAYS SAY IM GOING TO GET MARRIED TO HIM ONE Tag JUST WATCH! Includes trivia, pictures, Links and merchandise. Ashley played "Alice Cullen" in the movie. an answer was added to this question: how is good locking? 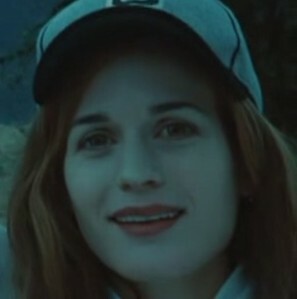 a comment was made to the pop quiz question: In the Twilight movie, how does Bella come accross the term "cold ones"?